Bluebirds are found only in North America. Enjoy learning more about how these birds raise their families. Know the threats they face. This fun-to-use guide will help you learn all about opening and managing your own bluebird house or trail, an important step in supporting bluebird populations. Special feature - a 35 minute video by Helen Johnson on mountain bluebirds. Quick reference guides to make managing your bluebird house a snap! Plans for 2 different style bluebird houses. 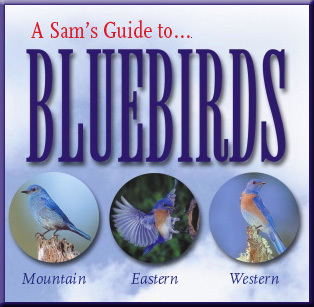 Sams's Guides are published by Web Spectrum Inc.